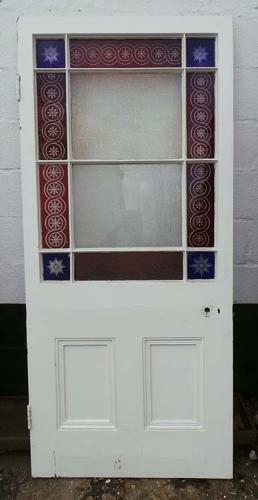 This lovely original Victorian pine door is fully morticed and tenoned, and features a geometric glazed panel above two solid panels, fitted with decorative mouldings to both faces. The glass is original textured, etched and coloured glass, with star engraved corner sections. One piece of etched coloured border has been replaced with coloured textured glass. NB There is no glass now in the largest two centre sections as this was non-compliant and had to be removed. We can quote to glaze this. The door is in good condition, and is currently painted.